Tuscany is famous for its unique edifices and cultural monuments. Some of the sights are evidence of centuries-old tradition, craftsmanship and history. There is hardly any region in the world that has such a multitude of architectural masterpieces to offer. There are many possibilities to admire the masterworks and art collections that emerged from the Etruscan origins to modernity. Among the countless notable events and historical celebrations, the Palio di Siena, the Carnevale di Viareggio and the Puccini Festival should be highlighted. Tuscany offers a culinary variety. The appealing and colorful offers on the menu are as diverse as the surrounding landscape itself. Everything is fresh, from the region, mostly seasonal, easy to prepare while tasting like gourmet cuisine. 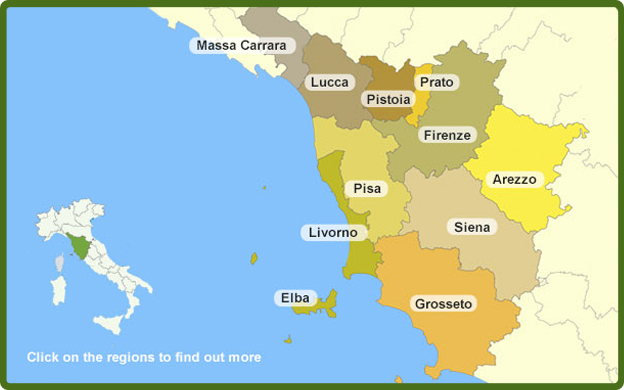 The wines of Tuscany are as diverse as the Tuscan landscape and are the result of a centuries-old tradition and history. Here wine lovers can find - still at reasonable prices - the best drops of wine for all tastes and occasions that can often easily compete with the famous French wines. Particularly interesting holiday accommodations are characterized for example by distinguished furnishings, an outstanding location, a extraordinary architecture, special offer conditions or an over average customer rating. Here you receive recommendations and further information. „Agriturismo“means countryside vacations or a (family) holiday on a farm, surrounded by the pastoral nature. Most of the time, the local products can be purchased right on-site. Usually holiday guests are welcome to participate in the production process, the harvest and the harvest festivals. GoTuscany.info Holiday, your specialist for Tuscany accommodation represents the most beautiful Tuscany accommodation. We offer a refined selection of exclusive luxury villas in Tuscany with swimming pools, tastefully converted Tuscany farmhouses & cottages, as well as large group holliday houses and centrally located holiday apartments in Florence, Siena, Lucca, Island of Elba (Isola d'Elba) or Pisa. If you decide to spend a pet friendly holiday, a family holiday or a romantic vacation in Tuscany, we can offer the most exclusive villas or praticular apartments in Tuscany farmhouses, Agriturismo called. From Massa-Carrara to Grosseto we have selected the most fascinating villas and holiday houses by the sea for your holiday rental in the Tuscan seaside. As the holiday rental business is always evolutionary, we are at the continuous search for the most suitable accommodation in Tuscany to meet different customers’ demands and needs. GoTuscany offers Online Booking and Real Time Availability to allow you the ease to book your vacation rental in Tuscany, Italy. We perfectly know every home rental we propose and know each owner of all our holiday rentals. So we can guarantee you that they will do everything to meet all your needs and make your holiday in Tuscany unforgettable.